Two and a half months into the damn comic and I’m FINALLY introducing one of the other main characters. Drawing Dennis taking his shirt off proved surprisingly difficult. Since next Friday is X-Mas and the one after that is New Years, I’m gonna take this as an opportunity to put the comic on a brief hiatus and work on a buffer. Once I’ve drawn enough pages, maybe I can start updating twice a week! Merry generic non-denominational secular winter holiday everybody, see you in the far flung future of 2016! After several months of anticipation I finally get to introduce Kristy in the webcomic! Dennis, Kristy and Wally have been the core characters of Battle Kreaturez since its very first draft. It’s great to finally see them back together. Not to mention I just plain love drawing Kristy. Next week I’m gonna start posting comic pages twice a week! New update days will be Tuesday and Saturday! And here’s Wade’s introduction page! It’s fun to write Wade and Kristy’s dialogue, I enjoy their bickering. Wade and Kristy are both about 6′ tall. The 4th panel really drives home how huge Dennis is. He could be in the NBA. At long last, Ben meets his saviour! It’s lust love gratitude at first sight. I’ve been eagerly anticipating the moment when Ben and the Wyldcard team would finally cross paths. Colouring that Wyrmflower on this first page drove me bonkers. Fortunately I found a more efficient method for the following pages it appears on. Also, made some updates to the site! I’ve got some fancypants social media buttons in the menu bar now. I’ve also overhauled the Kreature archive to make it more organized. Now all the Kreatures are sorted by rank. On that note, Wyrmflower has been added to the Kreature Archive. 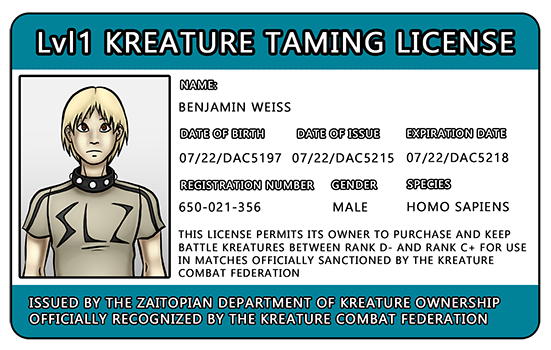 Along with posting notifications for new Kreature profiles on Twitter, I’ll also be posting them along with comic updates. I’ll get around to updating the cast page… eventually.